Larb Pa for lunch in Vientiane, Laos. This is a cooked version of Larb Pa, served with vegetables, fish soup, and warm sticky rice. Aunt Kian is afraid to eat raw Larb Pa. She always cooks it well done for the family members. The fish that is used for Larb Pa is known as Pa Thong. 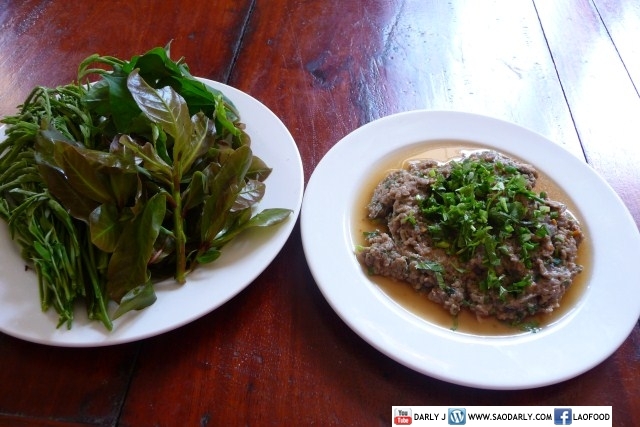 It is a freshwater fish of Laos and a favorite fish for making Larb.